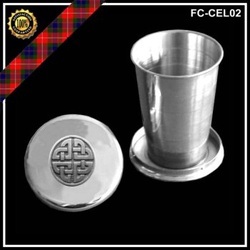 Not only fun, but extremely practical, this Folding Cup is a must for the busy traveler. It makes it possible to have a drink of any type anywhere. Remove the top cover and the cup telescopes up to its full height of 2-1/4". Great when you are traveling. For in your sporran, backpack, glove box, tackle box, boat, etc. Perfect if you fancy a quick tipple while you're on the move, this little stainless steel cup folds down, telescope-style, into its flat stainless steel case and measures only 1/2"high by 2"in diameter. An ideal accompaniment to a hip flask, this folding cup makes it much more convenient to enjoy a tot of warming brandy or whiskey while you're out and about in chilly weather. Material: Stainless steel Dimensions: Closed 1/2"x 2"diameter. Extended as shown 2-1/4"